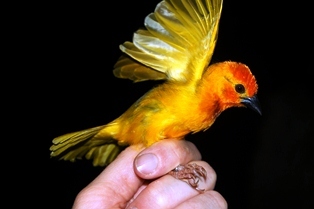 Note that Golden and Taveta Palm Weavers do not overlap in range, but both overlap with Eastern Golden Weaver. 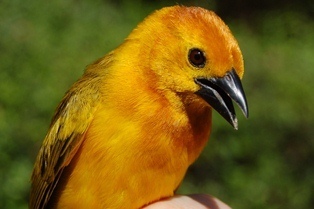 The greatest diversity of weaver species is in East Africa. 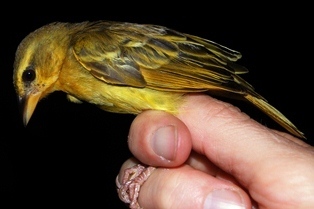 There are several 'golden' weavers and these can be tricky to identify. The three species shown here all have small colonies. Golden Palm Weavers nest mostly in trees (especially palms), and Taveta Golden Weavers nest mostly in reeds (sometimes in trees low over water); Eastern Golden Weavers nest in a wide variety of sites, including trees and reeds. 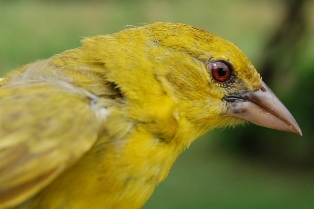 Holub's Golden Weaver - not illustrated here but is easy to distinguish from these weavers by its heavy bill and pale eye; it has minimal overlap in range with the 3 species shown above. 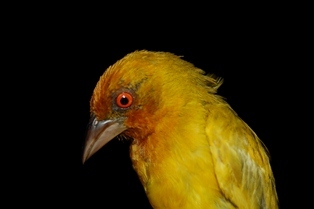 Orange Weaver - West Africa to Lake Victoria, overlaps with Holub's Golden Weaver, but not with the other weavers shown here.